The Australian sound poetry / film-maker / artist group ARF ARF consists of Marisa Stirpe, Frank Lovece, Michael Buckley and Marcus Bergner. Between 1985 and 2000 they produced and mounted hundreds of live performances in Australia and Europe. 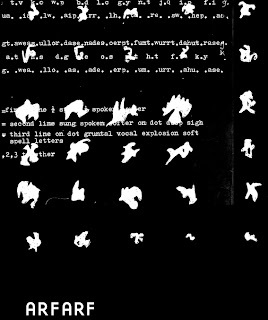 Their film 'Thread of Voice' (featuring Bob Cobbing / Konkrete Canticle) has been shown widely including at The Serpentine Gallery, London, The Pompidou Centre, Paris, Arsenal Kino, Berlin, Millennium, New York and at the Museum of Modern Art in Warsaw and Sydney. Presently the group is completing an anecdotal/collaborative/performative novella based on their previous performances. "The artistic work of Arf Arf, across all the media they use, is vivid, kinetic, involving, very humorous, full of the rawness and randomness and mysteriousness of life. It is an extremely heterogeneous art, clashing different styles, timbres, textures. It is both sophisticated, deeply considered, and also spontaneous and immediate in its poetic and emotional effects. It's full of almost violent juxtapositions and gear shifts - as well as sudden, lyrical passages of calm, poetic grace. Australia has produced few bodies of artistic work this captivating or internationally significant. (...) ARF ARF use written text as the starting point for sounds, reversing both the process of civilization and the cultural process, in this way descending to the bottom of civilization. All texts of culture transform into the primal sound from the time when it was not yet a letter, a word, or a text. Suddenly, the self-evident proves to be a mystery." Including 16 page illustrated booklet with liner-notes and essays in English.